Anyone who reads my posts with any regularity knows I’m rabidly anti-abortion in any form, for any reason. No matter how much I rant, though, these two pictures say far more than I ever could. Babies are miracles. There is no other way to describe them. Perhaps I’m feeling this more than the ordinary person due to some news I received on Christmas. My oldest is pregnant with her fourth, and possibly fifth child (twins are everywhere in the families). Now, this may not seem so remarkable; people become grandparents all the time. I thoroughly love being a grandma. But is is remarkable because by all rights my daughter shouldn’t be pregnant. See, her fiance had testicular cancer as a teen. Her two youngest children are his. So they’ve already bucked the odds with two beautiful, healthy children. However. My daughter had her tubes tied 13 months ago, after the birth of her third. Immediately after the birth. She had been pregnant for two straight years (the grandbabies are 5, 2 and 1). So, we have a man who is technically sterile and a woman who has been sterilized herself–and they are now pregnant again. There is danger involved as well. Because she had the ligation, there was a very good chance this child was an ectopic pregnancy and my daughter has been in extreme pain and ordered on bedrest. It was just too early to tell. Well, this past weekend, we finally found out–after a rather protracted emergency room visit. The baby is not ectopic and is stronly situated. We will have at least one new addition in late August. I’m sadistic enough to want twins, but any child is more than welcome in our family. Tell me, if this child ISN’T a miracle, can you please explain to me what is a miracle? God likes babies and sometimes goes to some awesome lengths to see to their arrival. Abortion destroys these miracles. 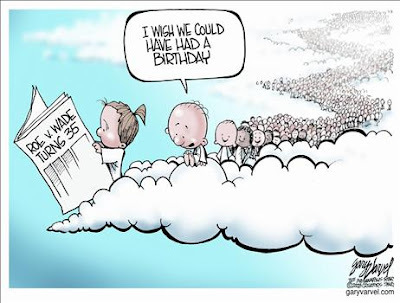 It sickens me and makes me weep for those mothers who will never hold that child and those children who will never have a birthday. 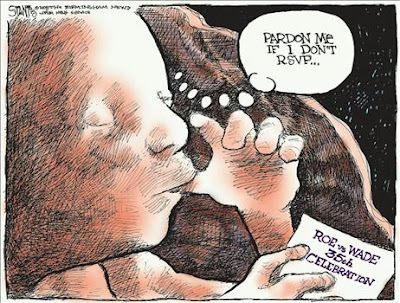 God help us if we continue to kill these miracles.